One of Saturna Seaside's best features is actually the outside. Our deck wraps around the house to provide a sunny entryway into the house, a lovely setting for lunch or dinner, and a peaceful place from which you can read a book or gaze at the ocean. 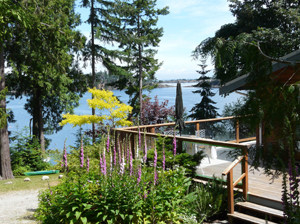 The deck is the first place you will visit when you arrive at Saturna Seaside. 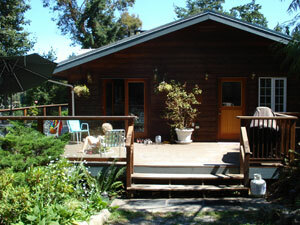 Two separate entrances to the house are both accessed by the deck. 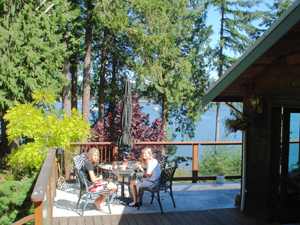 During your visit you can enjoy many meals on the deck. We have a table with four chairs and an umbrella for when you'd like some shade. While you eat or relax you can enjoy the lovely view. 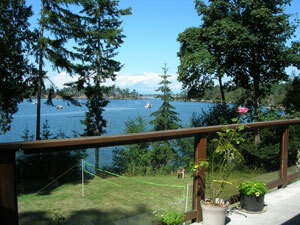 You can take in a breath of fresh air and enjoy the fantastic view from the deck. You can also sit up on this perch and watch as your family and friends enjoy a game of badminton or croquet! 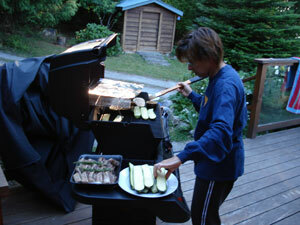 Our large kitchen is extended onto the deck in the very best way possible -- with a gas barbeque. The grill is large enough to cook a feast for all your friends and family!